In November 2018, residents of Michigan’ 25th Senate District elected Sen. Dan Lauwers, R-Brockway Township, to the state Senate, representing Huron, St. Clair, and Sanilac counties as well as Armada Township, Memphis, New Baltimore, Richmond and Richmond Township in Macomb County. Lauwers serves as chairman of the Energy and Technology Committee and vice chairman of the Insurance and Banking Committee. Lauwers is also a member of the committees on Agriculture; Economic and Small Business Development; Government Operations; Regulatory Reform; and Transportation and Infrastructure. Before joining the Senate, Lauwers served six years in the Michigan House of Representatives, representing the 81st District. 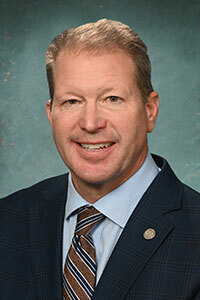 Prior to his time in the Legislature, Lauwers founded Eastern Michigan Grain in 1993 and led the company through 2013. He previously worked for the W.K. Kellogg Foundation and the National Milk Producers Federation. He also served as a legislative assistant in Washington D.C. to former Congressman Bill Schuette. Dan is the former chairman of the Brockway Township Recreational Council, St. Clair Soil Conservation Service, St. Clair County MSU Extension Education Advisory Board and the St. Clair County March of Dimes. He also is a member of the Michigan Agri-Business Association, Michigan Farm Bureau, American Society for Agronomy, American Soybean Association, National Corn Growers Association, National Grain and Feed Association and the Grain and Elevator Processor Society. Lauwers earned a bachelor’s degree in agricultural economics with an emphasis on marketing from Michigan State University. Dan and his wife, Kellie, are the proud parents of three children: Jon, Lauren and Nick. Lauwers is an active member of Sacred Heart Catholic Church in Yale council and a member of the church stewardship committee, and he serves as an usher. Senator Dan Lauwers can be contacted by clicking here.